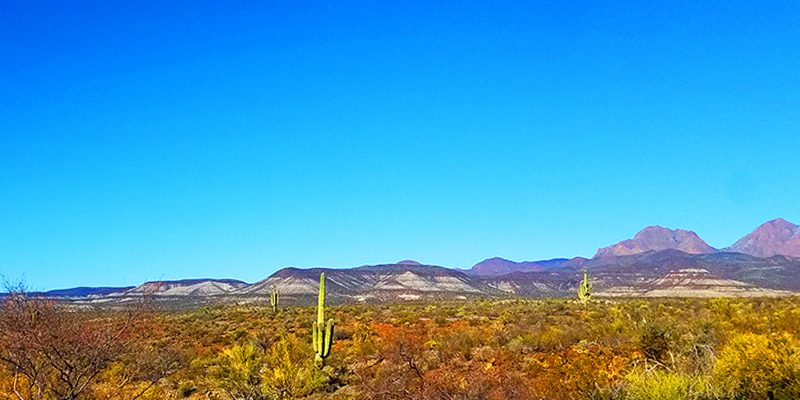 Over the holidays we spent ten days in southeastern Arizona for some t-shirt and big floppy sun hat weather. The plan was very simple — no coverage. Just down time to read books, sleep in, eat and dawdle. The cameras and note pads were packed away and we had agreed to dine out without asking our servers a bazillion questions. Then the whole scenario fell apart five seconds into our first glimpse of cute little Bisbee. 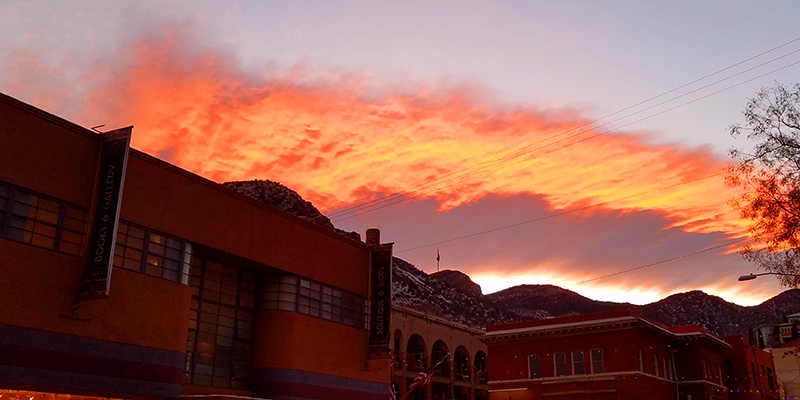 We were greeted with a blazing sunset over the historic downtown. 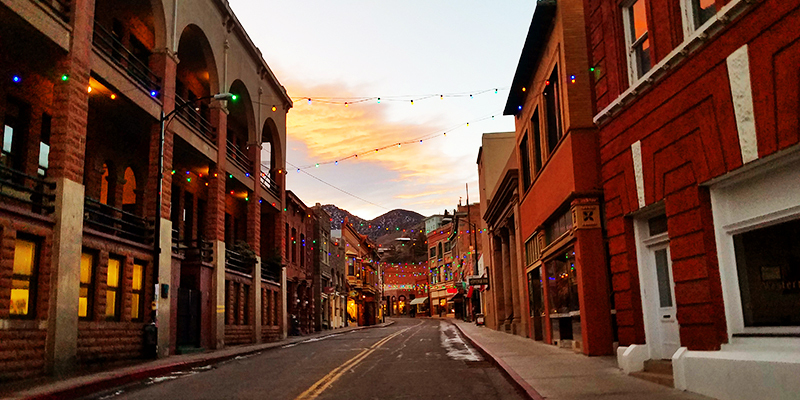 Out came the cameras and phones as we walked this charming mining town nestled in a long canyon, with rockin’ food and arts venues, and wagon loads of wild west history. 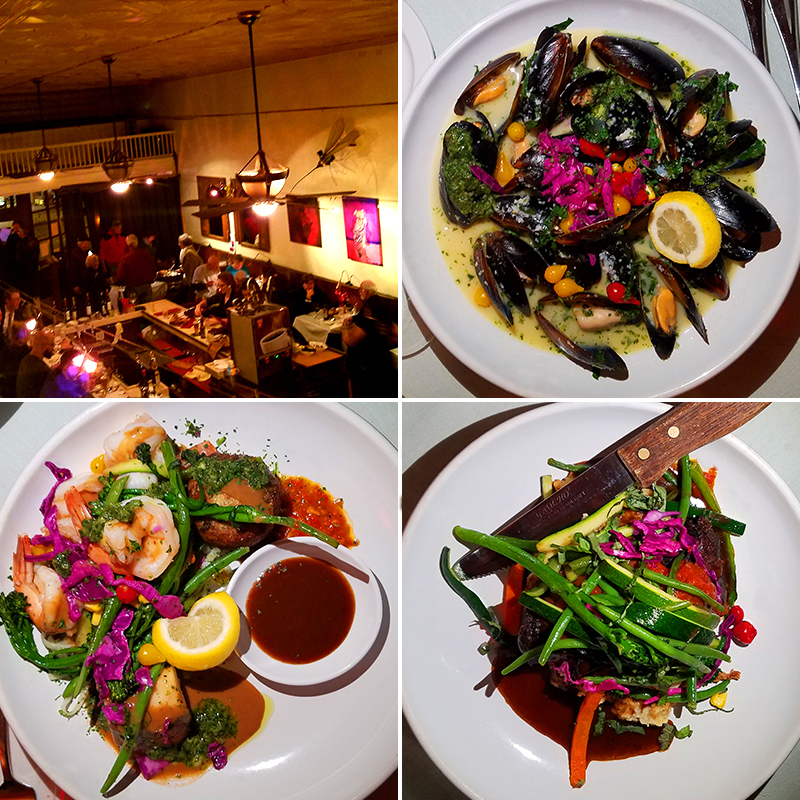 Our New Year’s dinner was spent at an amazing first-rate restaurant that would mingle perfectly with the New York or LA food scene. Seriously, one helluva delicious discovery. 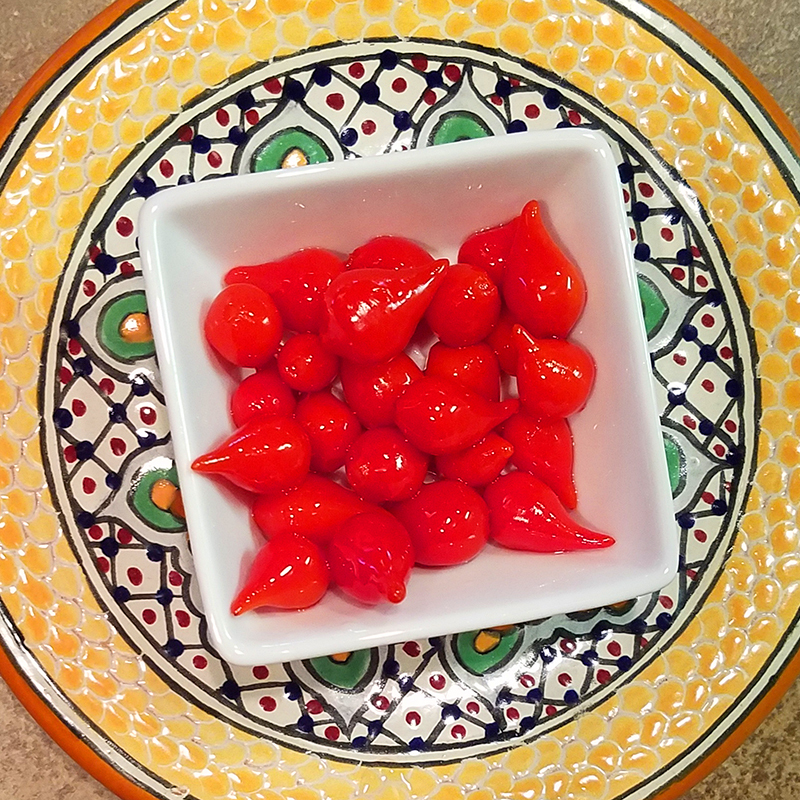 We met cool inventive artists and gallery owners, did our fair share of shopping, were introduced to a miniature beak-nosed pepper that’s been around a while but was new to us, and even took a day trip to nearby Tombstone. Like most mountain towns, Bisbee (pop. roughly 5200) became an 1880’s mining boom of copper, gold and silver, and we quickly learned about the high quality turquoise that came from the Copper Queen Mine. A dark and rich blueish color with brownish red spiderweb matrix. 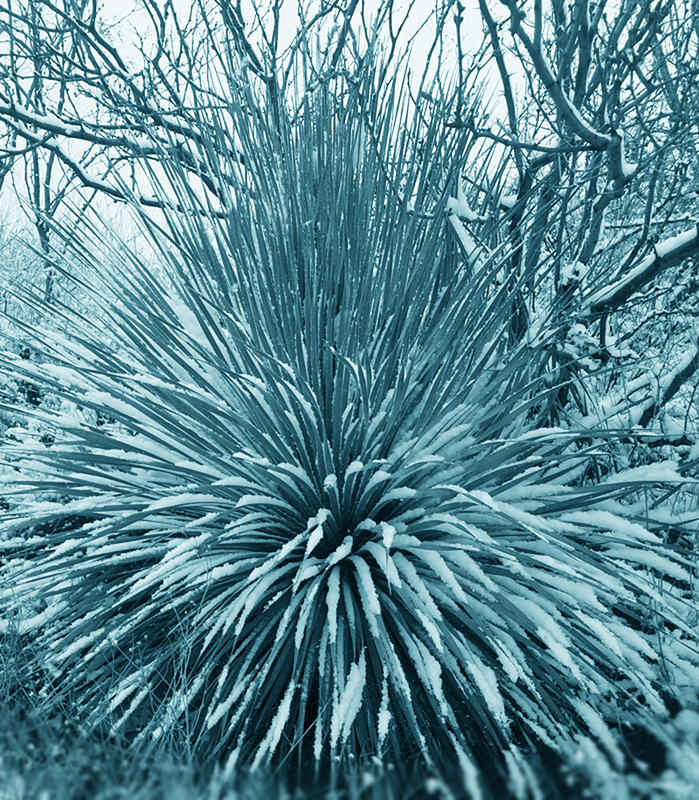 If you look close-up there are landscape patterns and new worlds to be found in the Bisbee Blue. By unanimous vote from friends acquainted with the town, Cafe Roka was recommended to us for New Year’s dinner. We can pretty much meter our favorite dining experiences by how many details we can recall later. Was it memorable? Would we go back? In a heartbeat, this place was extraordinary! We could eat the steamed blue shell mussels with white wine basil butter any day of the week, breakfast lunch or dinner. The seafood platter had the most luscious bass with sweet plump shrimp, briny crab-y crab cake (lots of crab, not so much filler) and savory sweet dipping sauce. What appeared to be a mountain of julienne salad were tender boneless short ribs over buttery mashed potatoes with a rosemary red wine reduction, piled with zucchini, green beans and pickled cabbage. Sweety Drop Peppers! a.k.a. Incan Red Drops. Averaging the size of a pea, the flavor was a surprise of tart, sweet, fruity pepper and tomato with a nice crunch. Some were mild, some mildly hot. They’ve been around for years but were news to us, and now we have two enormous cans in our pantry. We put them on salads, tacos, eggs, pizzas, pasta dishes, or just eat them like candy. Fine dining can be hit or miss while traveling. Roka is a hit. We remember every taste and wish we could pop by for that succulent sea bass right this very minute. Bisbee Breakfast Club, home of pancakes the size of an area rug. (We may be exaggerating but only a little). Located south of town in the neighborhood of Lowell, they have a huge dining space and big-plate hearty portions. We have heard that Eggs Benedict Mondays are beyond repoach. (couldn’t resist … sooo, so sorry!) There’s just no plate like foam for the hollandaise. (oops, there we go again). 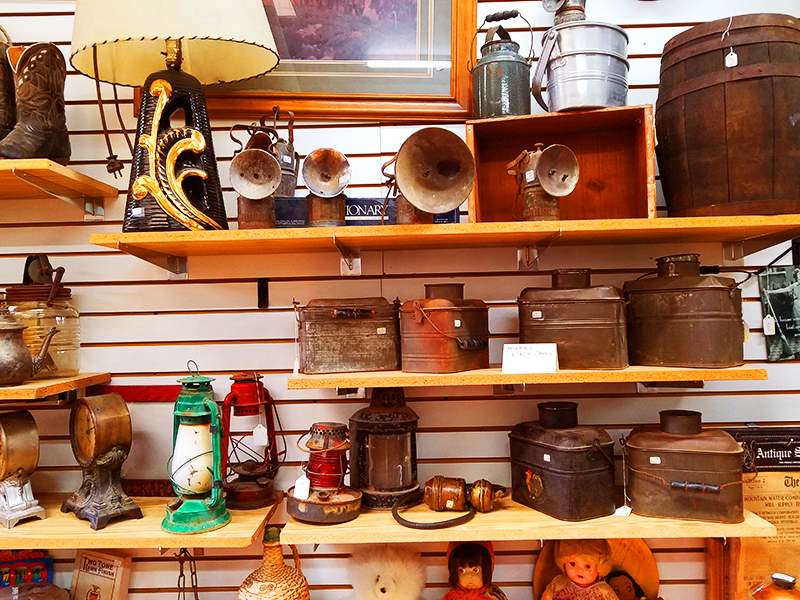 and an antique store filled with old west and mining artifacts, along with a wall of cowboy boots. Another must munch mention is Thuy’s Noodle Shop in the downtown area, making rock star Vietnamese dishes. We recommend the shrimp spring rolls, bubbling caramelized braised pork bowl with boiled egg, and fresh coconut for dessert. You really cannot go wrong here. It’s fresh, authentic, made to order comfort food. 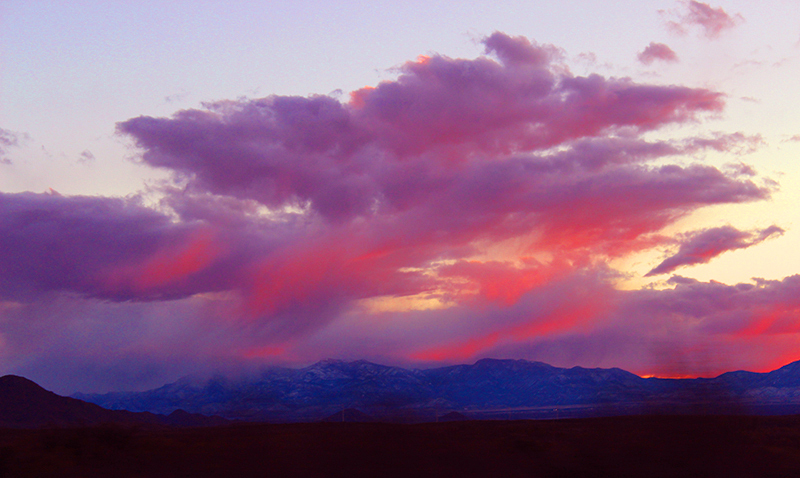 We’ll say it again, the best sunsets are found in the southwest. We look at the great big sky all day every day to see how impressive Mother Nature’s show will be. 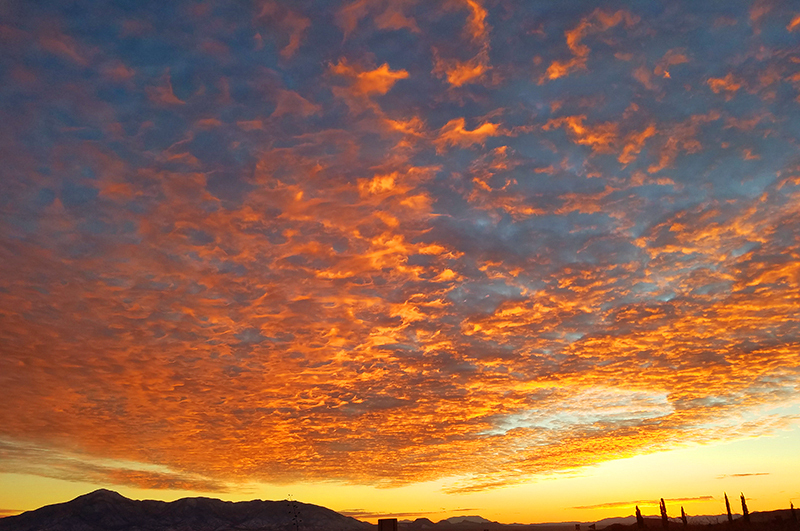 Bisbee’s skies were rosy, at times on fire, a pure aqua blue, and then one day they took an unexpected turn. 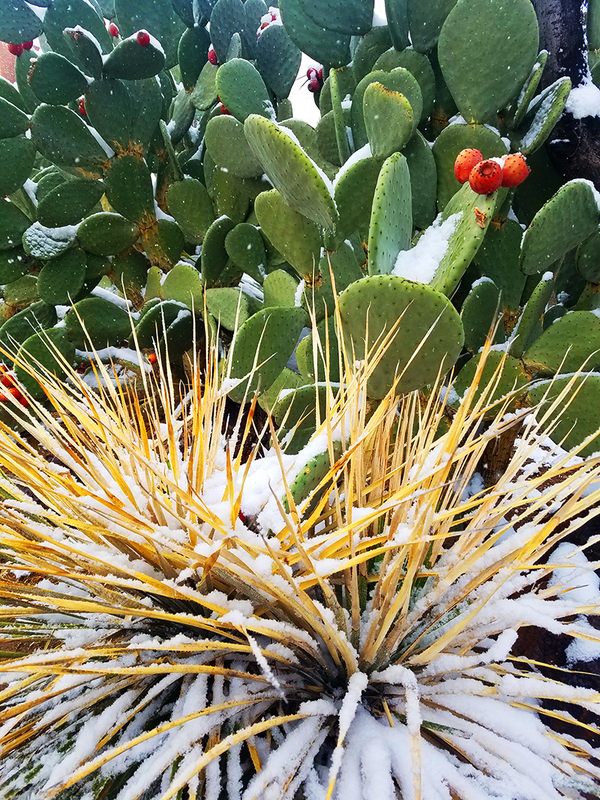 There is a saying in southern Arizona “We salt margaritas, not sidewalks.” Two days into our snowbird vacay a fluke snowstorm came through. Suddenly every kiddo in town was out the door with saucer sleds and building snowmen all over the place. We actually heard people discussing and questioning in depth as to whether you are supposed to salt or sand an icy driveway. The tagline was put into question! Were we miffed to pull on our scarves and boots again? Well, to be honest yes. At first. But if you know the quiet peace of the open desert then just imagine how calming and serene it is with a thick blanket of snow. And really how could we complain when we were in what felt like a holiday snow globe town where everything was new to us? We love new, especially when it’s cute and the food is great. 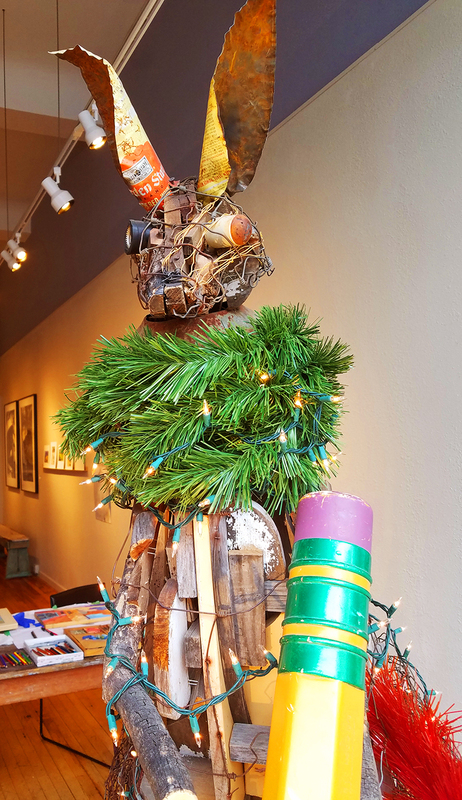 Located on a downtown side street, the window displays of kinetic art and a large rabbit of found objects lured us into this contemporary wonderland. Co-owners and artists Poe Dismuke and Sam Woolcoot not only display their work there but also have open work tables where you can chat while watching them sketch or paint. They also display works in progress to share their creative process. 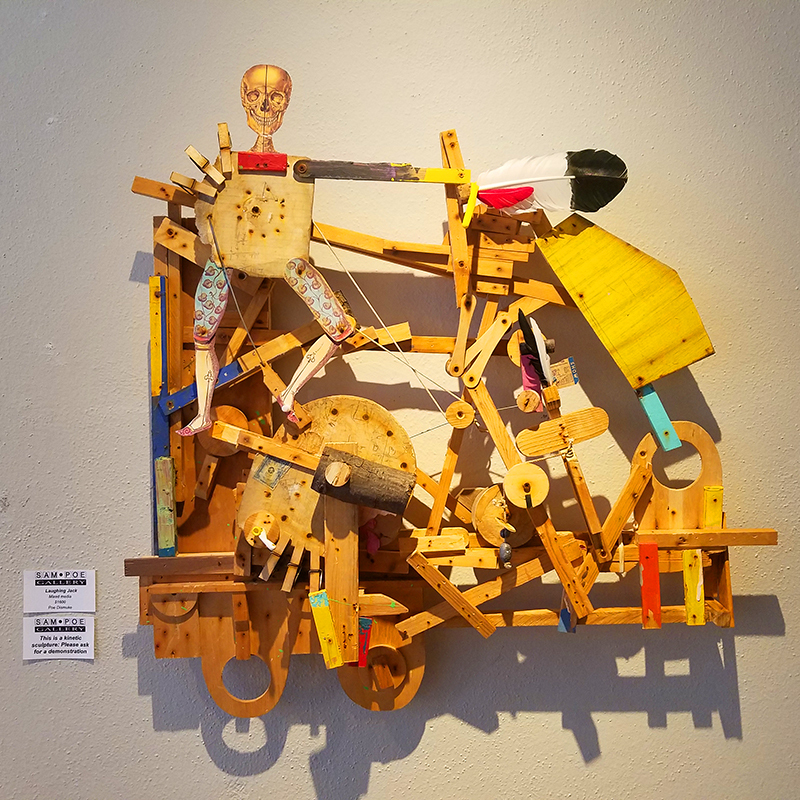 Poe’s kinetic sculptures reminded us of Rube Goldberg machine meets vintage circus, meets early 1900s cartoons, meets southwest, meets what we imagine is the craziest awesome dream journal on his bedside table. Read more about him here. 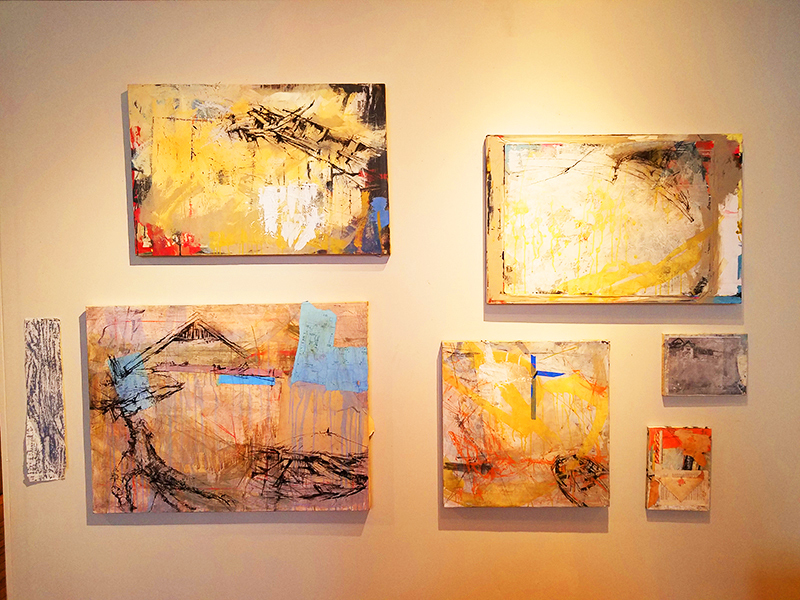 Sam’s paintings are described as an “opportunity to enjoy visual delights and curiosities, the precarious nature of local places and hardscrabble lives of those who came before.” We were fascinated with how each piece on display was an abstract world where we could place ourselves as we liked, sometimes recognize a shape or rooftop without giving away anything. She leaves much or just enough to the imagination and that is not an easy task. That is a gift. Read more about her here. Located near the Copper Queen Hotel, Subway is the place to go for local art. They’ve been in business for over thirty years and the artists work in the gallery. 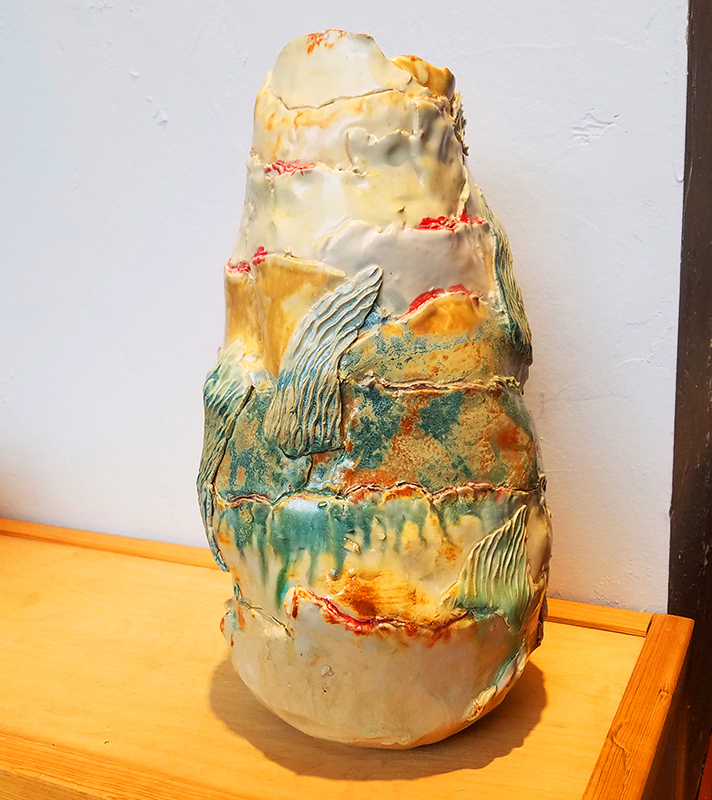 We were taken by this organic clay vessel by Margo McCartney. It’s a freeform, intuitive conversational piece and everyone who observes it seems to have a different opinion as to what it represents. And that’s just hands down cool. When in southeastern Arizona you must stop in Tombstone. The history is over the top lawless wild west, and they’ve done a great job preserving and/or re-creating the buildings and famous OK Corral. Several times a day, the Earp Brothers along with Doc Holliday confront the McLaurys and Clantons to re-enact the legendary shoot out. Thankfully a lot of humor and side joke banter goes on between the actors, with outlaws banging on a door, then quietly asking “Room service?” The actors are committed to the scenes, then completely break character to ease the tension. Otherwise it would be pretty jolting because the blank guns they use are movie guns that blast and ring in your ears for a while after the show, and they’re standing right there where the real deal incident took place. The Bird Cage (est. 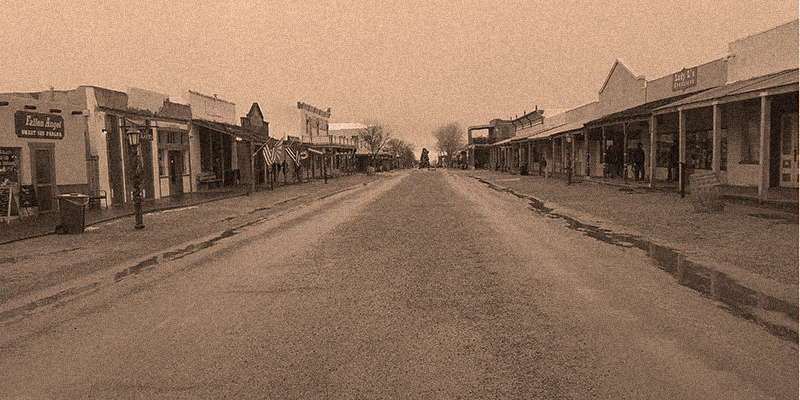 1881) is one of the authentic remaining buildings rich in bawdy rough and tumble wild west history. 26 people (that they know of) were killed there over the years and it’s still riddled with bullet holes. Today it’s a museum with the original stage where Lillie Langtry, Lillian Russell, opera singers, comedy acts and great talents of the day performed. Photos are not allowed in the theater area that is flanked by 14 second floor compartment rooms (like a train’s curtained sleeper cars) where the drapes could be drawn for privacy. The basement is the location of the longest poker game in history that lasted 24/7 from 1881 to 1889. Many of the original artifacts are on display, along with portraits of the most notable Ladies of the Evening (and apparently morning and day as well) who entertained the rowdy clientele. Tombstone has dozens of sites, a mining tour, Boot Hill, and it’s is a decent place to order a steak (check online reviews). Read more here on their official website. 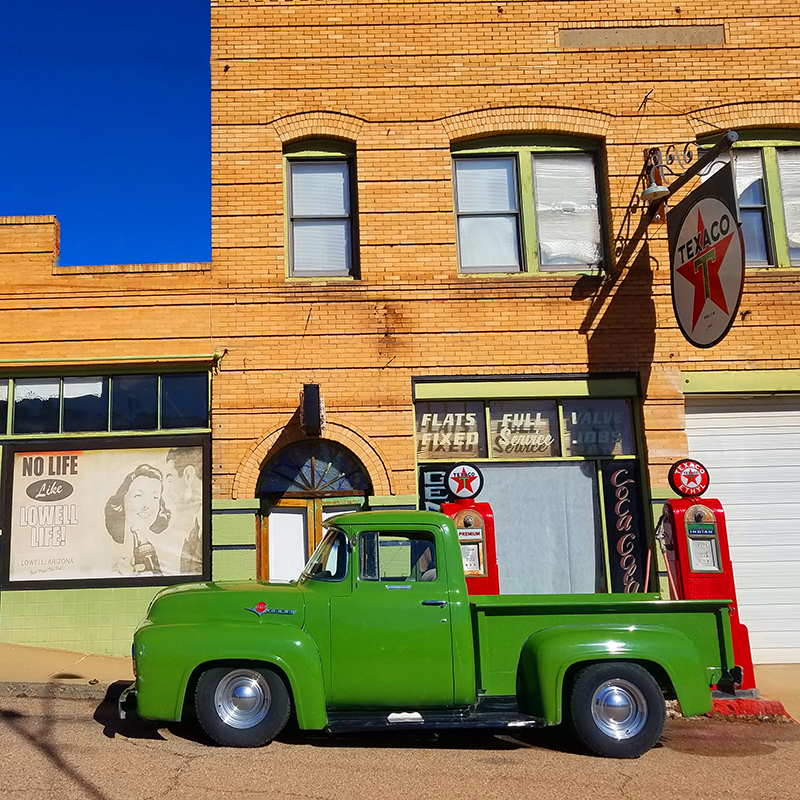 A couple spots we’ll catch on our next Bisbee trip are the Mining and Historical Museum, Queen Mine Tour, and here is their Discover Bisbee page with attractions, historic sites and restaurant listings. Coming Up: a new post on the Santa Fe Trail — Kansas City highlights and history. Very interesting, made me very hungry!!! Now I think I can identify Bisbee Turquoise. Especially loved the first photo of the sunset. You certainly have a way of taking people to the places you’ve been, while they don’t have to move a muscle to be there…….only a scrolling finger on the phone, perhaps! KayKay, the best part of what we do is sharing our discoveries and connecting with people. Such a lovely comment, thank you. I can tell you had a lot of fun with this one. I am ROTFLOL over the descriptions, thanks for the belly laughs! 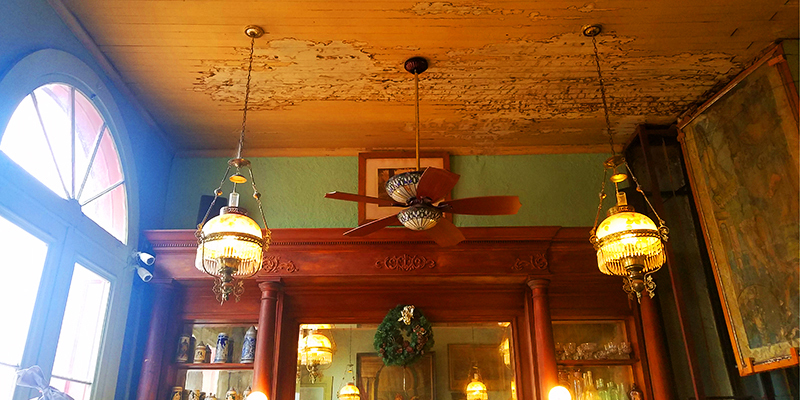 ChileSage, meander around Bisbee for a while, it does that to you. We had a blast! I enjoyed this one, you captured the town so I could feel what it’s really like. I still want to go there. Red, you’ll love it. We’re thrilled with how the article came together, given that we hadn’t planned to work, nor made any special arrangements. Guess that’s what lil’ Bisbee does for artists, you just can’t put the camera down. What a delightful article! You guys were a joy to show around. You have never lost the wonder and curiosity that comes to us at birth. 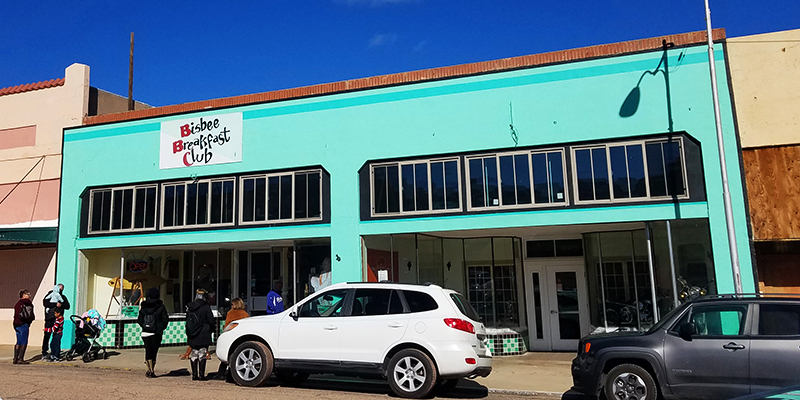 Thanks for the positive report about Bisbee. Thanks for coming for New Years. Margo, we cannot thank you enough and are forever grateful for your tips on places to see. 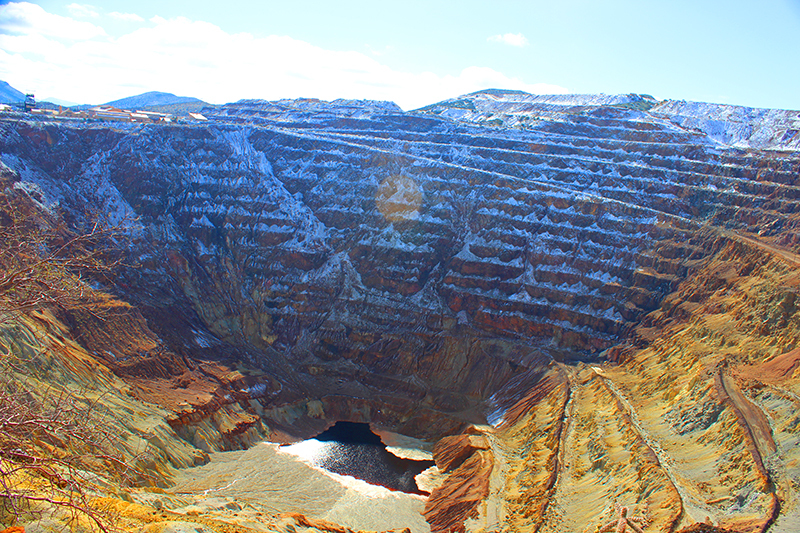 Looking forward to our next Bisbee trip, there’s so much more to cover! 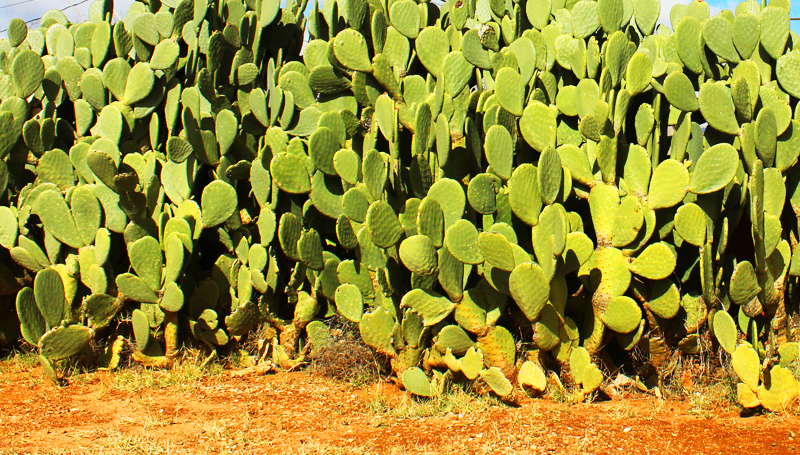 So happy you’ve discovered Bisbee! Woot woot!! 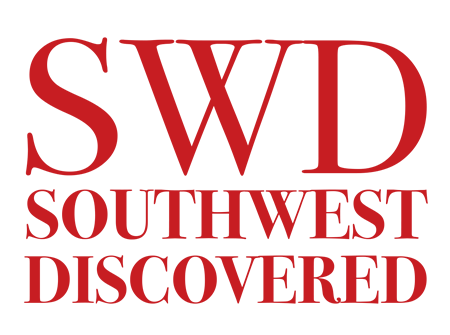 Hi Sunshine, one of our favorite things about the SW is that there is ALWAYS something new to discover. This one was definitely a woot woot!! I had no idea Bisbee and Tombstone are so close together and how cute it is. Sorry your plan changed but I can see what motivated you to unpack your cameras. Cafe Roka sounds so great we could go just to eat! Tina, we think of road tripping to Roka all the time. It’s that good! Egg-cellent post. 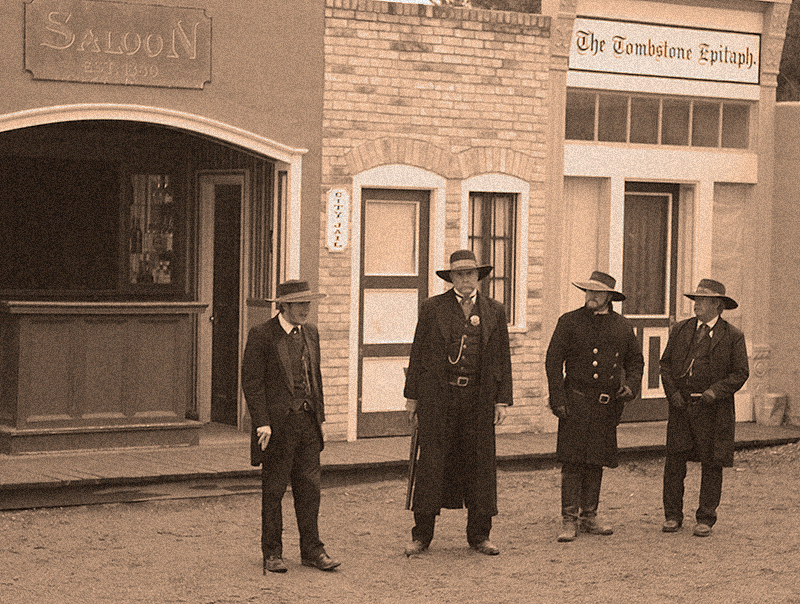 How long were you in Tombstone and can you cover everything in one day, or allow for two? Thanks! Shannon & Drew, Haaaaa! 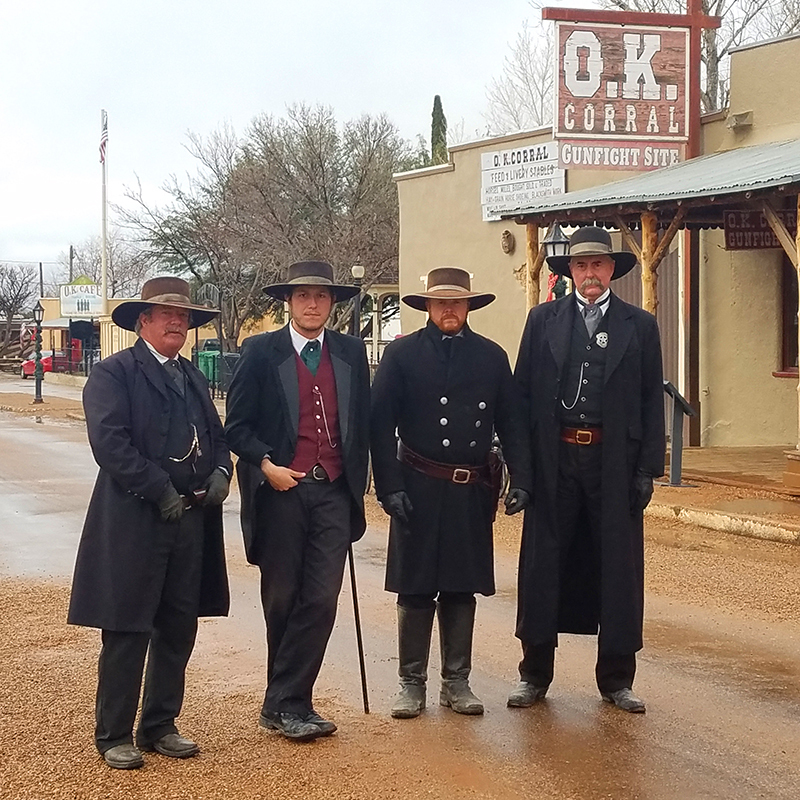 Tombstone is eggsactly 25 minutes north of Bisbee. You can easily see the sites, shop, eat, and wander into a saloon in one day. We would suggest making reservations for the mine tour and check in with Boot Hill before you go to check hours. They can be seasonal. 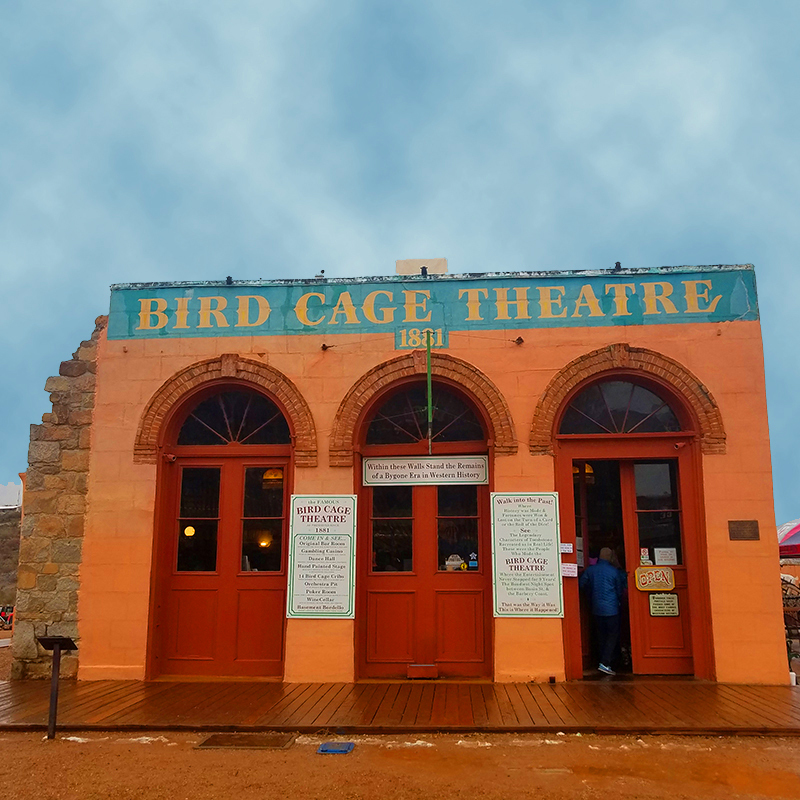 The Bird Cage is a must-see. So glad you picked up the cameras and decided to cover this. I’ve always wanted to head south to Tombstone and Bisbee from I-10 and now I will make that discovery!. Happy trails! Barb, it’s a wild west must-do. Have a great trip and please send pics so we can share with everyone!